It's impossible to avoid the influence of Latin culture in Miami and locals know the top-notch spots to experience the best of the best. Even at Miami International Airport, there's an outpost of one of the city's best Cuban restaurants, La Carreta. But instead of dining at MIA, get immersed at one of the several locations around the city. Here are a few neighborhoods and establishments where you can experience Miami's latin flavor to the fullest. 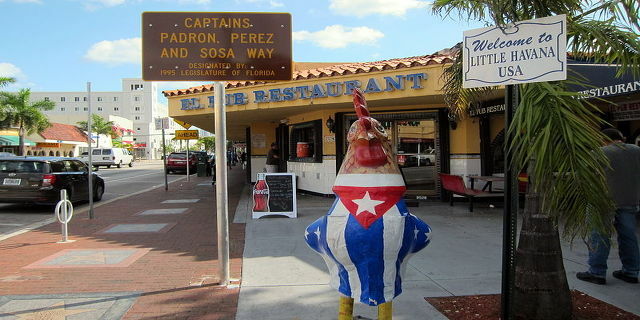 Little Havana, Miami's Cuban center, has a Latin flavor that is unique among other local neighborhoods. Signs are in Spanish, as is the dominant language, and Cuban coffee counters and cigar shops are never far. One of the best times to experience the neighborhood is on Friday evenings from 7pm to 11pm at Viernes Culturales (Cultural Fridays) where local artists, musicians, and restaurants flaunt their talents. Foodies should book a food tour in the neighborhood with Miami Culinary Tours, which takes places on Saturdays at 12:30pm and features some of the neighborhood's favorite flavors. Alternatively, simply stroll along 8th Street (Calle Ocho) and see the neighborhood for yourself; the sounds and smells will guide the way. There are a few fantastic bars and cafes that cater to Latin music lovers. Among the most famous is Jazid, which features a popular local Latin rock band on Tuesdays and Latin reggae on Thursdays. On Miami Beach, the Van Dyke Café features nightly Latin music acts and is a great place for drinking, dining, and people-watching. The Estefan-owned Bongos Cuban Cafe is an all-in-one experience including dancing and drinking. The Latin flavor pays homage to the couple's roots and love for Miami's flavor. Tapas, small appetizer-size plates, originate from Spanish cultures and are particularly popular in Spain and South America. In Little Havana, Versailles is a great place to order an amazingly-priced sampler ($7.65!) which includes a sampling of empanadas, yuca fries, and dips, among others. On Miami Beach, Tapas & Tintos Restaurant is a local favorite, specializing in Spanish tapas from the Andalusian region. At Coconut Grove's Lulu, each plate is only $10, so the strategy is to splurge and share. Take advantage of happy hour at Sugarcane Raw Bar Grill from 4pm to 7pm from Monday through Friday. The menu strays from strictly Latin (duck and brussel sprouts are two examples) but it's still just as tasty.